Spring is here, which means that summer will be here before we know it. #6. Inspect the coil drainage hose. The coil drainage hose is often referred to as the condensate line, and since the temperature in the coil is lower than that of the ambient air, condensation will start to form on the inside of the coil and drip to the tray underneath. However, over time, the tray can overflow, which could lead to flooding the unit or spilling out into your home. That’s why it’s important for the condensation to flow to a drain. Before you turn your unit on for the spring, make sure that the line is attached properly and will drain safely. #7. Get your ductwork cleaned. The ducts are what transfer the conditioned air around your home, but after a while, they can become full of dirt, dust and other debris. Keeping the ductwork in your home clean can help to enhance both the quality of the air that your breathe, as well as how efficient your air conditioner is. Clean ductwork also helps to ensure that the airflow throughout your home is distributed evenly, reducing cold or hot spots. #8. Install a programmable thermostat. For many of us, the hottest months of the year are also the most expensive, and part of the reason why these maintenance tasks are so essential is that they help to improve the efficiency in your home, keeping your energy bills as low as possible. One great way to reduce your energy bills during the summer is to upgrade to a programmable thermostat. With these thermostats, you can set the temperature in your home automatically for different times of the day. For example, when you’re at work or your kids are at school, you might set the temperature a little higher so that you aren’t paying to cool an empty house. 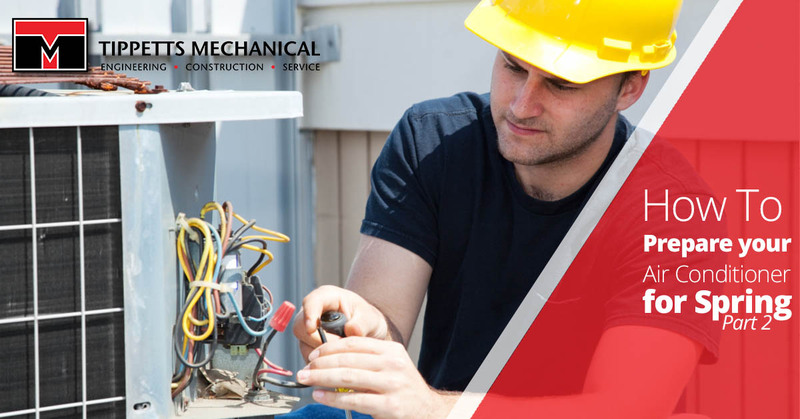 Don’t forget to get your system inspected and maintained by a professional. Although all of the steps we’ve gone over can certainly help you prepare your air conditioner for spring and summer, they can’t replace having a professional take a look. The air conditioning experts at Tippetts Mechanical know how to spot the signs of trouble, and they can help you keep your system running strong all spring and summer long. Contact us today to schedule your appointment.